In this paper we compare survival characteristics of transgenic and polyclonal CD4 and CD8 T cells. Transgenic CD4 T cells have an intrinsically lower capacity for survival, reflected in their gradual disappearance in thymectomized hosts, their increased sensitivity to apoptosis in vitro, and fewer divisions during homeostatic proliferation upon transfer into syngeneic lymphopenic hosts compared with CD8 T cells. Homeostatic proliferation, however, does not generally result in phenotypic conversion of activation markers unless cognate or cross-reactive Ag is present. T cells from the A18 TCR transgenic strain normally selected into the CD4 lineage are fragile as CD4 T cells, yet display the typical robust survival pattern of CD8 T cells when diverted into the CD8 lineage in a CD4-deficient host. Polyclonal CD4 and CD8 T cells also show distinctive patterns of survival, emphasizing that survival signals are relayed differently in the two lymphocyte subpopulations. However, expression levels of Bcl-2 in either transgenic or polyclonal naive CD4 and CD8 T cells are similar, excluding a role for this molecule as a key factor in differential survival of CD4 vs CD8 T cells. Following positive selection and maturation in the thymus, CD4 and CD8 T cells colonize the periphery and recirculate through lymphoid organs until they encounter Ag. Activation by Ag results in transient expansion of Ag-specific clones followed by contraction, so that the total number of peripheral cells remains in homeostatic equilibrium (1). The numbers of different T lymphocyte subpopulations appear to be independently regulated, suggesting independent niches that control the survival of naive or activated/memory T cells (2, 3). The mechanisms that determine the life span and survival of naive T cells in the periphery are not clearly defined at present. The presence of syngeneic MHC molecules with a diverse repertoire of peptides is essential for the survival of naive CD4 and CD8 T cells (4, 5, 6, 7), whereas memory T cells for both subpopulations can persist for a long time in the absence of MHC molecules (8, 9). This indicates that TCR-mediated signals are essential in the maintenance of the naive T cell pool, but not in the survival of memory cells. While mice with a polyclonal repertoire maintain their peripheral T cell numbers in the absence of thymic output (e.g., after thymectomy), this does not appear to be the case for all TCR transgenic mice, suggesting that individual T cell clones may have different requirements for their maintenance, probably depending on TCR avidity and the availability of selecting ligands (10, 11). Recent experiments transferring naive T cells labeled with a dye that allows monitoring of cell divisions into lymphopenic hosts have established the concept of maintenance as a sum of survival and proliferation (reviewed in Ref. 3). Although naive T cells have been shown to occasionally undergo division in their physiological environment (12, 13, 14), both CD4 and CD8 T cells proliferate much more efficiently in lymphopenic hosts. This is presumably due to the absence of cells competing for survival signals, because cotransfer of large numbers of T cells can suppress this expansion (15, 16). However, there seem to be substantial differences in the expansion capacity of cells with different TCRs. Despite the absence of bona fide cognate Ag in the adoptive hosts, some T cells appear to “fill the space” and even up-regulate certain activation markers, whereas others show restrained proliferation without changes in such markers (12, 13, 16, 17, 18, 19). In this paper we have analyzed different survival criteria for T cells from TCR transgenic mice and nontransgenic controls. Taken together the data suggest that CD4 T cells have an intrinsically lower capacity for survival compared with CD8 T cells, reflected in their gradual disappearance in thymectomized hosts, their increased sensitivity to apoptosis in vitro, and their fewer divisions upon transfer into syngeneic lymphopenic hosts. Interestingly, T cells from the A18 TCR transgenic strain normally selected into the CD4 lineage display the typical survival pattern of CD8 T cells when diverted into the CD8 lineage in a CD4-deficient host. Polyclonal CD4 and CD8 T cells also show distinctive patterns of survival, emphasizing that survival signals are relayed differently in the two lymphocyte subpopulations. The response to survival signals results in homeostatic proliferation, but not in activation, so that naive T cells do not normally undergo phenotypic conversion in their expression of characteristic activation markers such as CD44 or CD45RB. However, the presence of cognate or potential cross-reactive Ag for transgenic T cells causes phenotypic conversion, suggesting that under certain circumstances homeostatic proliferation is superseded by Ag driven proliferation. The strains used for these analyses were A18 TCR transgenic (Rag1−/− C5−/−H-2a) (20), A1 TCR transgenic (Rag1−/− C5−/− H-2a) (21), A18 CD4−/− (Rag1−/−C5−/−H-2a), AND Rag−/− H-2bxk (22), F5 Rag−/− H-2b (23), BM3 Rag−/−H-2k (24), as well as syngeneic empty Rag1−/−C5−/− H-2a, Rag1−/− H-2k, and Rag1−/− H-2b mice. Polyclonal controls were B10 (H-2b), CBA (H-2k), or A/J (H-2a). All mice were kept in conventional, but pathogen-free, animal facilities at the National Institute for Medical Research (London, U.K.). Analytical flow cytometry was conducted using a FACScan (Becton Dickinson, Mountain View, CA), and the data were processed using CellQuest software (Becton Dickinson). Three-color stainings were performed with FITC-, PE-, and biotin-conjugated mAbs (followed by streptavidin-RED670 (Life Technologies, Paisley, U.K.). Anti-CD4-PE (H129.19) was purchased from PharMingen (San Diego, CA), and anti-CD8 (YTS 169.4), anti-TCR Vβ8.3 (7G8.2), and anti-TCR Vβ8.2 (F23.2) were conjugated with biotin or FITC using standard procedures. Cells were preincubated with unlabeled mAb to FcγRII/III (2.4G2) to minimize unspecific staining. All stainings were performed on ice, and cells were washed with washing buffer (PBS, 2% FCS, and 0.1% azide). For detection of early apoptosis, single-cell suspensions were incubated with PE-conjugated anti-CD4 (PharMingen) and 20 μg/ml of 7-aminoactinomycin D (7-AAD)4 (Sigma, St., Louis, MO) for 20 min at 4°C as previously described (25). For analysis of Bcl-2 expression, cells were stained with PE-anti-CD4 or -anti-CD8 mAbs, fixed in PBS/1% paraformaldehyde, and then incubated with FITC-conjugated anti-Bcl-2 mAb or FITC-conjugated isotype control (Phar-Mingen) in saponin buffer for 30 min on ice. Single-cell suspensions from spleen and lymph nodes were cultured in 96-well plates (Falcon, Becton Dickinson) in 200 μl of IMDM supplemented with 5% heat-inactivated FCS, 5 × 10−5 M 2-ME, 2 × 10−3 M l-glutamine, 100 U/ml penicillin, and 100 μg/ml streptomycin. Cells were analyzed for apoptosis before and after 1, 2, and 3 days of culture. For CFSE labeling, cells were resuspended in PBS at 107/ml and incubated with CFSE (Molecular Probes, Eugene, OR) at a final concentration of 2.5 μM for 10 min at 37°C, followed by two washes in serum-free IMDM medium. Labeled cells were i.v. injected into syngeneic, untreated Rag−/− recipients. A18 mice that express transgenic TCR specific for an epitope of C5 presented in the context of H-2Ek were shown to gradually lose their peripheral T cells over a period of 6 wk following thymectomy, indicating a high turnover of peripheral CD4 T. To investigate whether this was a general phenomenon in TCR transgenic mice, four additional TCR transgenic strains were thymectomized and compared with thymectomized normal mice. All TCR transgenic strains were bred onto a Rag−/− background to avoid pitfalls due to the expression of additional unrelated TCR specificities. The A1 TCR transgenic strain selects CD4 T cells recognizing a peptide derived from H-Y presented by H-2Ek, the F5 TCR transgenic strain selects CD8 T cells reactive to influenza nucleoprotein epitope 366–374 in the context of H-2Db, and the BM3 TCR transgenic strain selects CD8 T cells reactive to Kb. A18 mice when bred with mice that lack CD4 (CD4−/−) select the A18 TCR exclusively into the CD8 lineage as observed previously in other CD4−/− TCR transgenic mice (26). Comparison of the percentage of CD4 or CD8 T cells in the blood before thymectomy and 60 days after thymectomy showed a similar trend for the decline in CD4 T cells in A1 and A18 mice, whereas the percentage of CD8 T cells in F5, BM3, and CD4−/− A18 mice remained largely unaffected by thymectomy (Fig. 1⇓). Four to eight mice per group from five transgenic mouse strains (all on a Rag−/− background) were thymectomized (ATX) or sham-thymectomized (control). 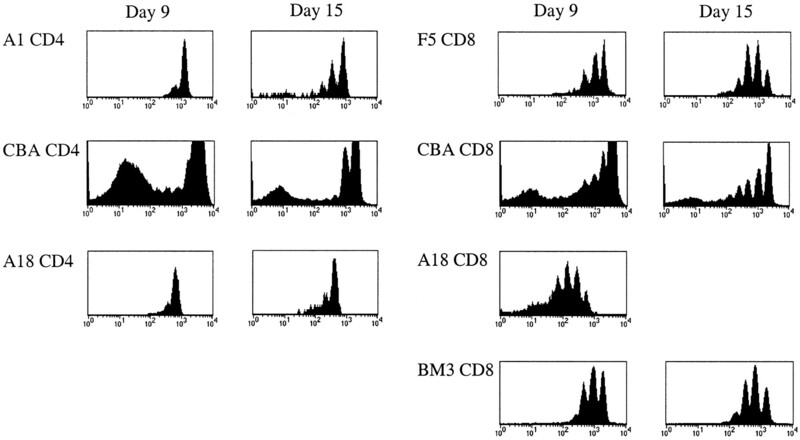 The figure shows mean ± SEM percentage of CD4 (A1 and A18 strains) or CD8 T cells (F5, A18CD4−/−, BM3 strains) in blood 1 day before thymectomy (day 0; □) and 60 days after thymectomy (▪). The p values, determined by paired t test, show significant differences for A1 and A18 before and after thymectomy, whereas all other groups are not significantly different. Resting T cells have drastically reduced life spans when removed from their stromal environment and cultured in vitro, and survival under these conditions has been shown to be promoted by cytokines such as IL-4 or IL-7 (27). To evaluate whether peripheral T cells from different strains show differences in their susceptibility to apoptosis when removed from their stromal environment, we cultured spleen cells from the five TCR transgenic strains as well as from nontransgenic controls for 3–4 days in the absence of Ag or cytokines and determined apoptosis by staining with 7-AAD. Background levels of apoptosis were between 5 and 10% in T cells from all strains at the start of culture. However, there was a striking difference in the apoptosis rate of A18 CD4 T cells compared with polyclonal CD4 T cells. About 50% of the A18 CD4 T cells showed signs of apoptosis already on day 1 of culture (Fig. 2⇓A). 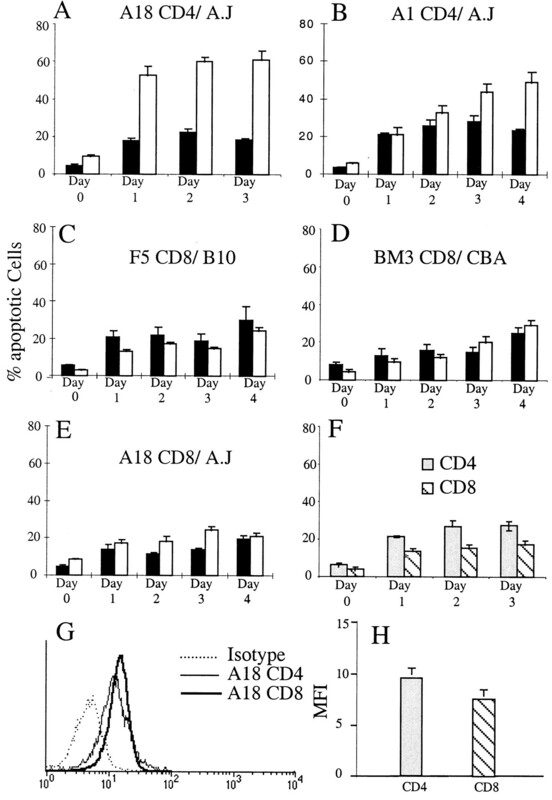 The percentage of apoptotic cells in A1 CD4 T cells was similar to that of polyclonal cells for the first 2 days of culture, but then their rate of apoptosis exceeded that of polyclonal CD4 cells, similar to the situation found for A18 T cells (Fig. 2⇓B). In contrast, CD8 T cells from F5 or BM3 TCR transgenic mice did not differ in their rate of apoptosis from polyclonal CD8 T cells (Fig. 2⇓, C and D). Interestingly, CD8 T cells with the A18 receptor showed a similar low increase in the rate of apoptosis over the 4-day culture period (Fig. 2⇓E). Given that even polyclonal CD4 T cells undergo apoptosis more readily than polyclonal CD8 T cells (Fig. 2⇓F), it seems that the differential susceptibility to apoptosis is an intrinsic property of each lineage, although is not clear whether there is a connection between apoptosis in vitro and survival in vivo. An obvious candidate molecule that could be involved in the differential survival of CD4 and CD8 is Bcl-2 (28). However, we could not detect a significant difference in the levels of Bcl-2 expression between CD4 and CD8 subsets in transgenic A18 T cells or in CD44low polyclonal T cells (Fig. 2⇓, G and H). Spleen and lymph node cells from five transgenic mouse strains, all on a Rag−/− background (□), as well as polyclonal T cells (▪) were cultured four 3–4 days in medium without Ag (A–E). Polyclonal controls are from the A/J strain in A, B, E, and F; from CBA mice in D; and from B10 mice in C. The percentage of apoptotic cells ± SEM in the gated CD4 or CD8 population was determined by staining with 7-AAD before culture and after each day of culture. G, Expression of Bcl-2 on fresh A18 CD4 T cells (thin line) compared with A18 CD8 T cells (thick line). The stippled line represents the isotype control curve. H, Mean fluorescence values for Bcl-2 expression in fresh polyclonal CD4 or CD8 T cells (from CBA mice). The p values, determined by Student’s t test, were <0.005 for days 1–3 in A, and <0.03 for days 3 and 4 in B. The p values in C–E indicated no statistical differences between cells from transgenic mice and control cells. The p values in F were <0.01 for days 1–3. A number of recent reports described cell division (homeostatic proliferation) of naive peripheral T cells when these are transferred into syngeneic, supposedly Ag-free lymphopenic hosts, where they do not encounter competition for survival niches with other lymphocyte populations. Homeostatic proliferation depends on MHC/peptide recognition, but the nature of the peptides involved and their relation to peptides that effect positive selection in the thymus are still unresolved (16, 29, 30). To compare homeostatic proliferation of different cell populations, spleen cells from the five TCR transgenic strains as well as from nontransgenic controls were labeled with the tracker dye CFSE (31) and injected into syngeneic Rag−/− mice devoid of lymphocytes. Fig. 3⇓ shows the CFSE patterns 9 or 15 days after transfer. While CD8 T cells (Fig. 3⇓, right panels) have undergone several divisions by day 9 after transfer, CD4 T cells (left panels) divide much more slowly. A18 and A1 CD4 T cells show only one peak of division 9 days after transfer and two or three peaks after 15 days. In contrast, homeostatic proliferation of CD8 T cells with the A18 receptor is comparable with that of other CD8 T cells. In polyclonal T cells a fraction of both CD4 and CD8 T cells divided rapidly and lost CFSE label. In all likelihood these were preactivated T cells, as indicated by their high levels of the CD44 activation marker (data not shown; see also Fig. 4⇓). The naive cells, in contrast, showed the same pattern of proliferation for CD4 and CD8 as that seen in transgenic T cells, emphasizing that there must be intrinsic differences in the way homeostatic survival signals are transmitted in CD4 and CD8 T cells. Homeostatic proliferation of CFSE-labeled lymph node cells from four transgenic mouse strains and polyclonal T cells 9 and 15 days after transfer into untreated syngeneic Rag−/− recipients. The histograms show CFSE levels on gated T cell subpopulations. Left panels, CD4 T cell proliferation; right panels, CD8 T cell proliferation. 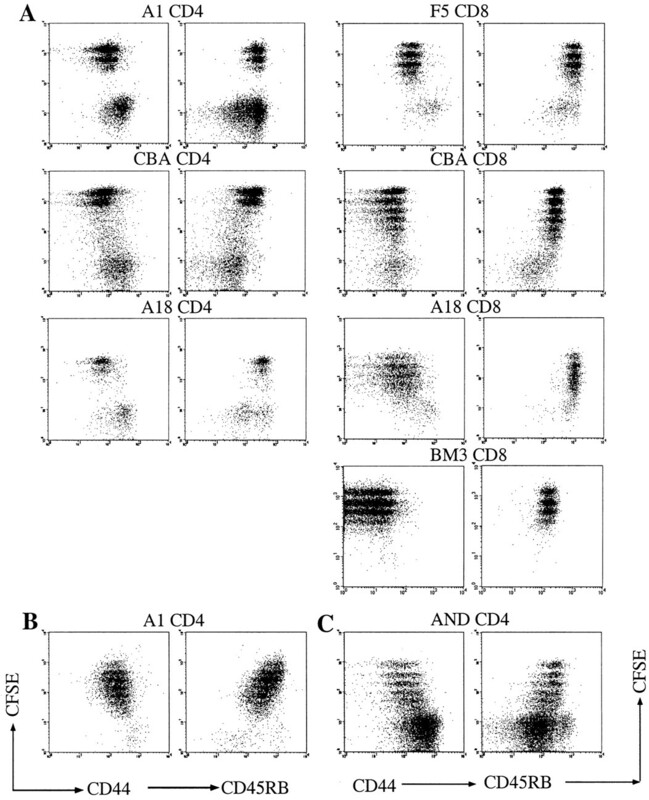 A, The dot plots show staining for CFSE (y-axis) and either CD44 or CD45RB (x-axis) of gated CD4 and CD8 T cell populations 15 days after transfer (9 days after transfer for A18 CD8) into untreated syngeneic Rag−/− recipients. B, CD44 and CD45 RB expression on A1 CD4 T cells 3 days after transfer into syngeneic male Rag−/− mice expressing cognate Ag. C, CD44 and CD45 RB expression of AND (kxb) CD4 T cells 9 days after transfer into untreated Rag−/− (H-2b) recipients. The CFSE-negative populations (with the exception of those seen in Rag−/− recipients of polyclonal T cells) are derived from the host and are not T cells; they are CD44high and negative for TCR expression. Because naive T cells can be distinguished from activated T cells by the expression of activation markers such as CD44 or CD45RB, we wanted to address the question of whether homeostatic proliferation observed after transfer results in phenotypic conversion. T cells from the five TCR transgenic strains used in this analysis did not show any changes in their expression levels of CD44 or CD45RB during homeostatic proliferation. The majority of naive polyclonal CD4 and CD8 T cells did not change the expression of activation markers, although a small fraction of polyclonal CD8 T cells slightly increased CD44 expression after the fourth or fifth division (Fig. 4⇑A). It should be noted that the CFSE−, CD44high, CD45 RBlow population visible in recipients of transgenic T cells is not donor derived and does not express TCR. In contrast, phenotypic conversion was clearly evident after transfer of CFSE-labeled H-Y-specific A1 T cells into syngeneic male Rag−/− mice, where they encounter their cognate Ag. This resulted in an increase in CD44 expression and a reduction of CD45RB expression already evident on day 3 after transfer (Fig. 4⇑B). In contrast, CD4 T cells from the AND TCR transgenic strain rapidly proliferated, up-regulated CD44 progressively with each division, and down-regulated CD45RB despite the absence of a defined antigenic ligand in the adoptive host (Fig. 4⇑C). The survival of naive peripheral T cells is a complicated process involving signals through the TCR and competition with other lymphocytes for environmental niches, ligands, or cytokines. There is a hierarchy of thymic and peripheral selection in which some lymphocytes are more easily replaced by competitors than others (33). This is most likely a reflection of the avidity of TCR interactions with a varying choice of selecting and/or survival ligands. 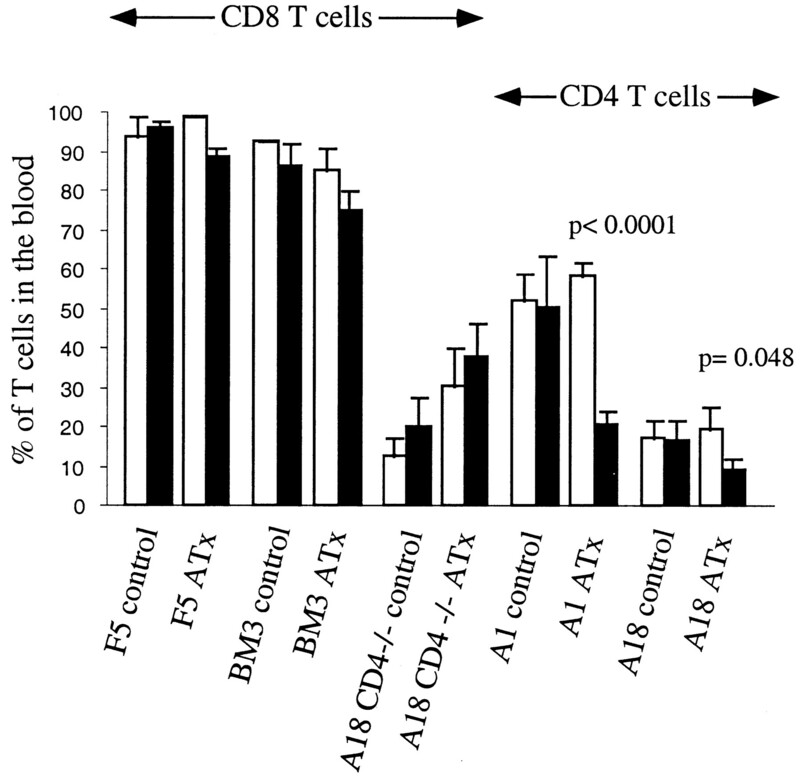 The A18 TCR transgenic strain on a Rag−/− background develops few peripheral CD4 T cells, which are relatively short lived compared with normal CD4 T cells. In contrast, CD4 T cells in A18 Rag+ mice are present in similar numbers as in nontransgenic controls and show much more robust survival patterns (data not shown). In this situation, however, the better survivors are almost certainly T cells with endogenous or additional TCRs. Proof of this assumption requires the generation of H-2Ek/C5 peptide tetramers. In this paper we investigated the survival of additional TCR transgenic strains, all on a Rag−/− background so that they express single TCRs exclusively as well as polyclonal T cells. The results obtained highlight three main points: 1) A18 CD4 T cells are not the only ones with survival problems, as we found a similar phenotype in the A1 TCR transgenic strain; 2) CD4 T cells are per se shorter lived than CD8 T cells whether they are from transgenic or normal mice, and survival signals are relayed in a different manner in CD8 T cells compared with CD4 T cells; and 3) activation markers such as CD44 and CD45RB remain unchanged during homeostatic proliferation in lymphopenic hosts, distinguishing it from Ag-driven proliferation. The phenotype of A18 and A1 T cells is that of T cells with a narrow specificity and/or low affinity TCR recognition. Although it is still a matter of debate whether ligands involved in thymic selection are the same as those that procure peripheral survival signals (16, 29, 30), selection in the thymus sets the threshold for the susceptibility to survival signals (34). T cells from the highly selecting AND strain show extensive expansion upon transfer into lymphopenic hosts, although susceptibility to apoptosis in vitro is similar to that of A18 and A1 T cells (data not shown). The fact that proliferation of AND T cells in vivo is accompanied by the acquisition of activation markers similar to those seen in Ag-driven expansion indicates that the AND TCR is more promiscuous, with a lower threshold for survival signals, some of which might represent cross-reactive Ags. A similar phenotype in CD4 T cells with hemagglutinin-specific ABII TCR that incorporated bromodeoxyuridine and up-regulated CD44 following thymectomy or transfer into lymphopenic hosts was attributed to recognition of an unidentified ligand (13). Regardless of the spectrum of survival patterns seen in different TCR transgenic strains, it was obvious that naive CD8 T cells survive better than naive CD4 T cells. This was most clearly illustrated in the different survival characteristics of CD8 vs CD4 T cells bearing the same A18 TCR. Despite the fact that A18 CD8 T cells are less responsive to cognate Ag than A18 CD4 (our unpublished observation), they do not decay after thymectomy, are less fragile in vitro, and undergo more extensive homeostatic proliferation. It is unclear at present whether this reflects more efficient transmission and subsequent signaling upon interaction with survival ligands or whether CD8 T cells are more responsive to the presence of distinct survival mediators, e.g., cytokines (35, 36). An obvious survival factor, such as the anti-apoptotic molecule Bcl-2, showed similar expression in naive CD4 and CD8 T cells of either transgenic or normal mice, but it is possible that other members of the Bcl-2 family, such as Bcl-xL, may be differentially expressed in the two cell types. CD4 and CD8 T cells appear to occupy overlapping niches in the periphery, because cotransfer of large numbers of either subset can suppress the expansion of both (15, 16). The ratio of CD4 to CD8 T cells in normal mice is controlled homeostatically, but less is known about its conservation in the absence of thymic output. Recent thymic emigrants contain about 4 times more CD4 than CD8 T cells, and normalization of the ratio in secondary lymphoid organs implies that some CD4 T cells are deleted, whereas, in contrast, some CD8 T cells are proliferating (37). The question of how homeostasis is achieved after profound T cell depletion and in the absence of thymic output has important consequences for therapy in humans. It is known that peripheral expansion leads to a substantially skewed repertoire dominated by cells with memory/effector phenotypes at the expense of naive cells in addition to low CD4 T cell numbers (38). The observation that the CD4/CD8 ratio drops in mice as a function of age due to the disappearance of CD4 T cells rather than to the expansion of CD8 T cells (39) is in agreement with their differential survival characteristics, which under physiological conditions may only become apparent once thymic output ceases or becomes negligible. There are conflicting reports in the literature as to whether the often vigorous proliferation observed after transferring naive T cells into supposedly Ag-free lymphopenic hosts affects the expression of activation markers (2, 13, 16, 17, 30, 40). Some studies even described spontaneous development of effector functions upon transfer of transgenic CD8 T cells into irradiated recipients (32). In our experiments most polyclonal T cells with a naive phenotype did not change their expression of CD44 and CD45RB when transferred into syngeneic Rag−/− mice, although they proliferated vigorously. In polyclonal CD8 T cells there seems to be a slight increase in CD44 expression after the fourth or fifth round of division, but it does not affect all cells. The CD44-positive, CFSE-negative population evident in recipients of polyclonal cells represents cells with an activated/memory phenotype already present in the initial inoculum. In contrast, the population with a similar phenotype seen in recipients of Rag−/− transgenic T cells is not derived from the donor population. It does not express TCR and is probably identical with a CD4+ CD3− cell population found in developing lymph nodes; these were shown to differentiate to APC, NK, and follicular cells, but not to T and B cells (41). Given that high expression of CD44 is a stable marker that distinguishes naive and memory T cells and does not revert (in contrast to CD45RB expression) (42), it seems unlikely that proliferation of naive T cells in response to mere survival signals generally results in phenotypic conversion. Alternative explanations for the discrepancies described in different systems could be 1) the use of Rag+ mice in which bona fide activation of dual TCR-expressing cells or cells with other endogenous TCR by environmental Ag cannot be excluded, 2) high affinity TCRs cross-reactive to environmental self Ags or hyper-reactive to survival ligands, and possibly 3) the use of irradiated hosts. Irradiation results in gastrointestinal damage, leading to the release of LPS (30, 43). This could liberate cross-reactive Ags and result in mobilization of Ag-bearing dendritic cells to lymphoid tissues, thus promoting T cell activation (44). T cells with high avidity TCR promiscuously responsive to many ligands such as AND T cells might be genuinely activated by cross-reactive Ags when they undergo phenotypic conversion, rather than proliferating in response to baseline survival signals. As such they would enjoy preferential survival at the expense of T cells with more restricted TCR recognition, for whom survival signals may be limiting. The AND and A18 TCRs may represent opposite ends of the spectrum with respect to their responses to TCR-mediated signals, but, in general, homeostatic expansion of naive T cells in conditions that eliminate competition should be viewed as distinct from Ag-driven expansion followed by phenotypic conversion. We thank Dimitris Kioussis for critical comments on the manuscript and Trisha Norton and Keith Williams for keeping our mice under control. ↵1 C.F. was supported by a Ph.D. fellowship (Program PRAXIS XXI) from the government of Portugal. S.G. was the recipient of an EMBO long-term fellowship. ↵2 Current address: Unité d’Oncologie Virale, Institut Pasteur, 78 rue du Docteur Roux, 75015 Paris, France. ↵4 Abbreviations used in this paper: 7-AAD, 7-aminoactinomycin D; CFSE, carboxy-fluorescein-diacetate succinimidylester.